A nod to carbonara, but for vegetarians. You could add Parmesan to the sauce but if so, leave out the saffron; this simple recipe would be ruined by the conflicting flavours. In a cup, cover the saffron with 2 tbsp hot water from the kettle and set aside. Slip the broad beans out of their skins to reveal the ‘inner’ bean. Spread the asparagus out in a large frying pan and add enough boiling water to half-cover the spears. Simmer on a high heat for 2 minutes, turning the spears occasionally. Add the beans and cook for a further minute, until the water has been absorbed and the asparagus is cooked. Meanwhile, cook the gnocchi in salted water for 2 minutes, until they float to the surface. Drain in a colander and return to the hot pan (off the heat) with the butter. Stir in the egg yolks with the saffron and water and plenty of pepper. Stir until the butter melts and the yolks form a sauce. 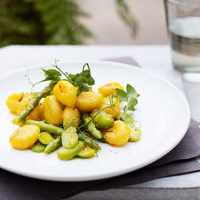 Mix in a pinch of salt and the vegetables; serve in warmed bowls with the pea shoots.